The January 2019 Revenue Report has been released and this months reports are in the negative. For the month, the budget is 5.8 million below the sine die estimate, however the year to date report is over the estimate by 2.82 percent. 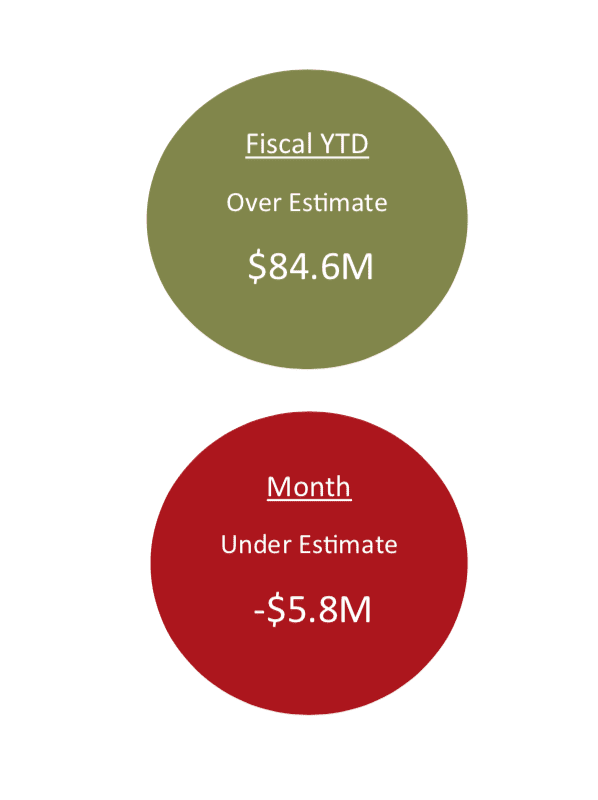 Total revenue collections for the month of January FY 2019 are $5,811,321 or 1.36% below the sine die revenue estimate. Fiscal YTD revenue collections through January are $84,634,179 or 2.82% above the sine die estimate. Fiscal YTD total revenue collections through January 2019 are $99,826,218 or 3.35% above the prior year’s collections. Individual tax is down over one percent. Cooperate tax is up over 20 percent and Use tax is up over 19 percent. Unemployment rates are at 4.7 percent in the state, the national average at 3.9 percent.